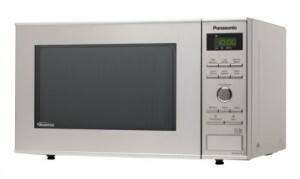 The 23 litre Panasonic NN-SD271SBPQ solo microwave features a stainless steel finish and 950w of power. The angular stainless design portrays a modern style, with the digital time display font reminiscent of 1980's watches. Long narrow buttons represent the majority of the NN-SD271SBPQ's interface, with a central dial providing a degree of finesse for accurate timing purposes. In terms of specification, this solo microwave is essentially a medium capacity high powered model, with a reasonable price tag and an excellent sturdy build quality. Well constructed, easy to use and good value too. Peace of mind is provided by Panasonic's excellent after sales support, although given the renowned reliability of Panasonic appliances we shouldn't envisage this will be required! The feet of the microwave can slip slightly on certain surfaces when opening the door. Asides from that, we couldn't fault it, despite extensive testing in four different households. 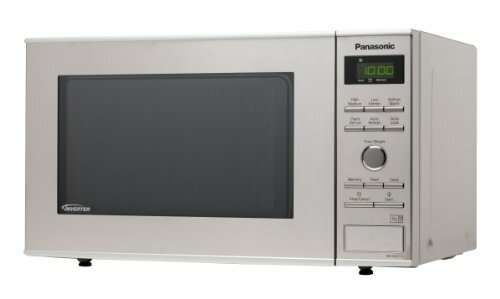 The Panasonic NN-SD271SBPQ is a 23 litre mid sized solo microwave, which although priced at the higher end of the solo bracket, is very well constructed and offers 950w of power output. 10 Auto programs are featured, with the maximum providing 950 watts. These are controlled by a series of well labelled buttons - each is marked with a large font, and as such this microwave is remarkably easy to operate. Common tasks are programmed in with very short button sequences - meaning you'll spend less time pressing buttons to complete the operations you need. The exterior is finished in stainless steel, which looks smart and gives the appliance an expensive modern appearance. Our test team were impressed by the attention to detail, with the digital timer display reminding some of us of retro digital watches! Some modern looking microwaves plump for slightly experimental and flamboyant designs which although may currently be on trend, will quickly look dated when styles go out of fashion. With the NN-SD271SBPQ, Panasonic have opted for a refined and subtle finish, which although modern in style, won't age like other models, which is reassuring considering the price tag. The capacity is middle of the road - 23 litres is about right for a medium sized household, with a 28.5cm turntable fitted. The interior is finished in an acrylic grey for easy maintenance and cleaning. As with the majority of Panasonic's models, the Chaos defrost system is included, which in our experience is one of the most effective defrosting systems on the market - a bonus for those of you who cook and freeze meals in advance. The only slight issue we have with this model that on certain surfaces it can move slightly, as the feet aren't amazingly grippy. We tested this model in four different kitchens, on both tables and work surfaces, and wouldn't consider this issue enough of a problem to prevent us from purchasing, as movement is minimal, but feel it's only right that we point it out to our readers. Overall we really liked this silver microwave - it is incredibly easy to use, cooks really well, and looks great. Granted it's not the cheapest, but despite the price tag we feel it represents very good value for money, and we wouldn't hesitate to recommend this model from Panasonic. Overall the Panasonic NN-SD271SBPQ is a very good investment - it is well constructed, the controls are pretty simple to use, easy to clean, and more importantly cooks very well. The classic subtle design appealed to our team, and should last the test of time without appearing dated, as should the components due to the substantial build quality. Ultimately it's a solo microwave which is built to last, and one which we are happy to recommend to our readers.